Isolated on its mountain platform by surrounding burning hot deserts, Ethiopia is located at the crossroads of three major world religions. It's fascinating history is witnessed today by ancient churches, castles and some of the largest stone obelisks ever hewed. The high mountain habitats also saw the evolution of some unique endemic flora and fauna, and spectacular sheer escarpments. Then there is there the Lower Omo River region! As the Omo River flows through the southwestern part of the country it travels through the home to some of Africa's most unvisited and most decorated tribal peoples. A virtually roadless area, the Omo River becomes the avenue allowing access to the wonders of the area: pristine wilderness camps, unique birds and wildlife and in many ways is a journey back in time. Our specialties are rafting and trekking, but along with our our scheduled trips on the Omo, Awash, and Blue Nile Rivers we're happy to offer our services for small groups, film projects, and further exploration of this amazing country. The Omo is a special river, a real African Queen. First run in 1973, it remains one of the world's most renowned river experiences. 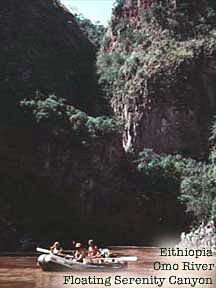 The trip combines spectacular scenary, exciting rapids, wildlife, exotic tribal peoples in a remote wilderness setting. There has been little change in the Omo Valley over the years, snaking between wild cliffs and green/brown hillsides from the Gige Bridge 185 km southeast of Addis Ababa, to the scorched bushland near the Sudan border. The trip begins in Addis Ababa, the colorful and vibrant capital of Ethiopia. We'll have the opportunity to visit the world's largest open air market and to shop for a variety of crafts and silver jewelry. On the first night in Addis Ababa, a get acquainted meal is our chance to enjoy a traditional Ethiopian feast of injera (a spongy flatbread) and wat (any of a number of spicy dishes), washed down with tej (a potent honey mead) or the good local beer. By air/land to Bahar Dar, Gondar, Axum, and Lalibela. This classic circuit includes the Blue Nile Falls, Lake Tana's island monasteries and painting-adorned churches. Gondar's 17th century castles and Debre Berhan Selassie church, and Axum's 2000 year old massive obelisks. Markets, coffee ceremonies, and live music add a contemporary human touch. This circuit combines well with the Simien Mountains trek. With an impressive number of endemic species (30) and overall numbers approaching 840 (a mixture of Eastern / Western African species and Palearctic migrants) Ethiopia is attracting growing numbers of birders from around the world. Our highly skilled and enthusiastic bird experts would be happy to arrange personalized birding tour for you or your group. To view several of our set biring itineraries, please click on the link above. A spectacular escarpment sheltering large troops of the endemic gelada baboon and the last remaining populations of the endemic Walia ibex. Afro-Alpine meadows and heathlands are also home to a few magnificent Ethiopian wolves. 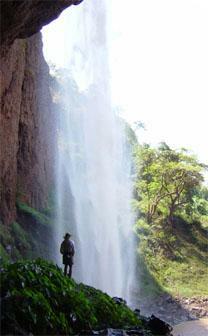 Treks of 5 days allow sufficient time to visit the most scenic and wildlife-rich areas. Ethiopia's highest peak, Ras Dejen, can be included with the addition of 3 more days. Sure-footed Abyssinian horses and mules carry the gear and are available for riding as well. This is Africa's largest Afro-Alpine massif, with stands of giant heather, juniper forest and high grassland, where Mountain nyala and Ethiopian wolves are easily seen. There are many endemic birds, and trout-fishing is possible outside the Park. For those seeking the least-visited, most authentically traditional areas, we started treks into the Shengema Mountain range, north of Jinka. These highlands range from 4,500 to 11,000 feet, with green forest, massive stands of wildflowers, and neatly fenced farms of the friendly and peaceful Ari people. A seven-day circular trek with horses can be combined with a visit to the nearby Mago National Park.